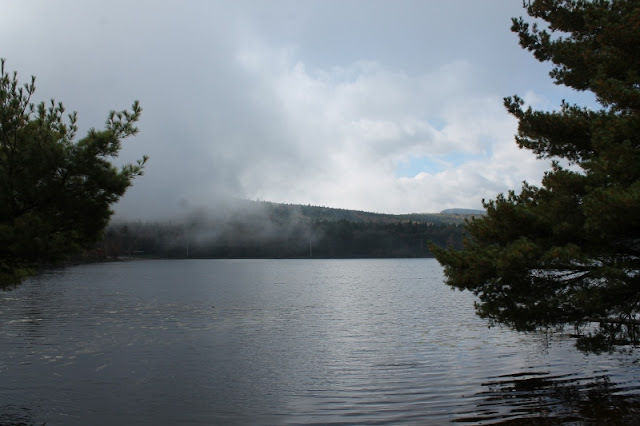 Alan and I just recently returned from a week-long camping adventure at North-South Lake. I love fall in the Northeast – both the crisp, sunny days that are just right for outdoor adventures and the longer, cooler nights that are perfect for pulling up a favorite quilt. What I don’t like is the fact that, once fall arrives, I know the end of our camping and boating season is near. Over the past few days, we’ve been emptying our travel trailer and packing our camping gear away for the winter. Alan is in full “winterization” mode, having to deal with the boat, the new travel trailer and the older travel trailer which is still onsite at our rental property. Yup, the poor guy is busy as a beaver. Although our Outdoors RV Creek Side travel trailer is a true “four seasons” RV (with thermal pane windows, extra insulation, an enclosed and heated underbelly and a cold weather package on the refrigerator which allows it to operate at temps down to zero degrees), we don’t usually camp beyond mid-October. Maneuvering the travel trailer into its “parking place” at home requires backing it up the driveway, across the front yard, around a sharp bend, between two gates and way up the hill to a leveled, out of the way spot. Although Alan has been hauling trailers of one sort or another for more than 40 years and can generally maneuver anything, anywhere, that sharp bend is tricky to tackle because it gets slick in the rain or snow. 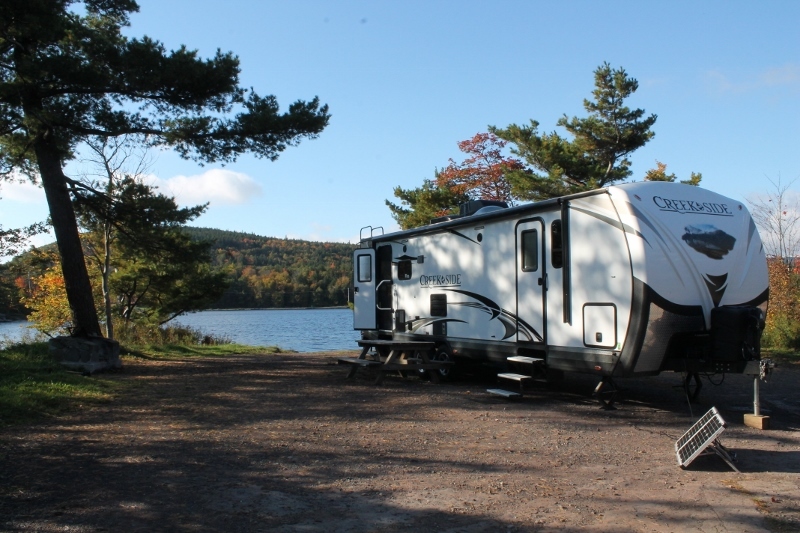 The adjacent drop-off dictates that we err on the side of caution so, once the boat is in its garage and the travel trailers are on their pads in the fall, they generally aren’t moved until we get through the spring thaw and ensuing mud season. But, I digress. 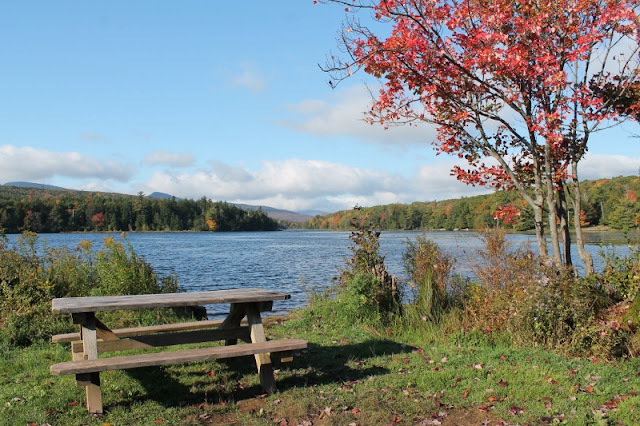 Let’s get back to North-South Lake – a gem in the Catskill Mountains of New York. 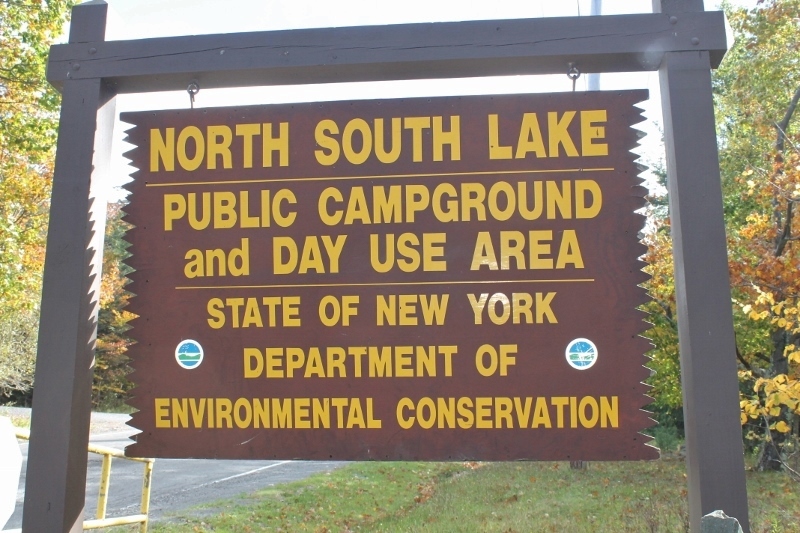 The North-South Lake campground and day use area is owned by the state of New York and operated by the state’s Department of Environmental Conservation (DEC). The DEC manages a number of other properties in the state, as well, including our favorite - Northampton Beach on Great Lake Sacandaga. A round of applause and our sincere appreciation go out to the DEC since the properties under this agency’s control are usually in excellent condition and staffed with friendly and helpful employees and Park Rangers. Many cups of coffee were consumed while enjoying this view out our back window. North-South Lake is the site of the former Catskill Mountain House, an enormous hotel built in the 1820’s to house the hordes of people who escaped from the heat of the cities to the coolness of the mountains each summer. These city residents traveled by steamship up the Hudson River and then via stagecoach to the hotels in the mountain communities. In later years, railroads were built to accommodate these travelers and the Catskill Mountain House and other hotels in the Catskills remained popular summer destinations until the age of the automobile expanded the possibilities for city travelers. Late in the 1920’s following the downturn in the hotel business, the state of New York acquired the North Lake property for public use. South Lake, at the time, remained privately owned and was acquired by the state at a later date at which time the dam between the two lakes was removed. The Catskill Mountain House remained standing until the 1960’s when it was razed by the state for safety reasons. 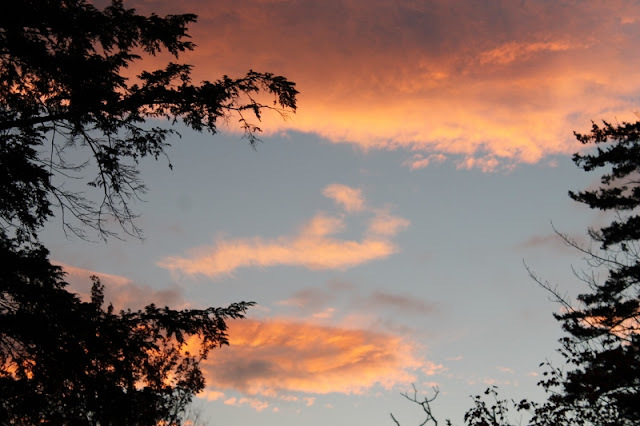 The escarpment that marks the site of the former hotel is an easy walk from the campground or main parking lots and provides an incredible view of the Hudson River Valley (and a number of states beyond) that hotel guests enjoyed from the front porch. From the mid to late 1800’s, North-South Lake was a favored location of Thomas Cole and other artists from the Hudson River School who were inspired by the area’s waterfalls and spectacular mountain views. According to the Metropolitan Museum of Art, the Hudson River School was “America’s first true artistic fraternity” and included not just Cole but Frederic Church, Albert Bierstadt and Asher Durand, as well. Kaaterskill Falls, a two-tiered waterfall of over 200’ (one of the tallest in New York) was a popular subject of their paintings and remains a tourist favorite today. The falls, located on state-owned property just outside of the North-South Lake facility, are accessible via a hiking trail at the bottom and a fairly new viewing platform at the top. Despite the area’s impressive history, I must admit that it’s the beauty of the lake, the mountains surrounding it and the views they offer that keep calling me back. These mountains would be dwarfed by others such as the Rockies, but they’re quite appealing in their own special way. 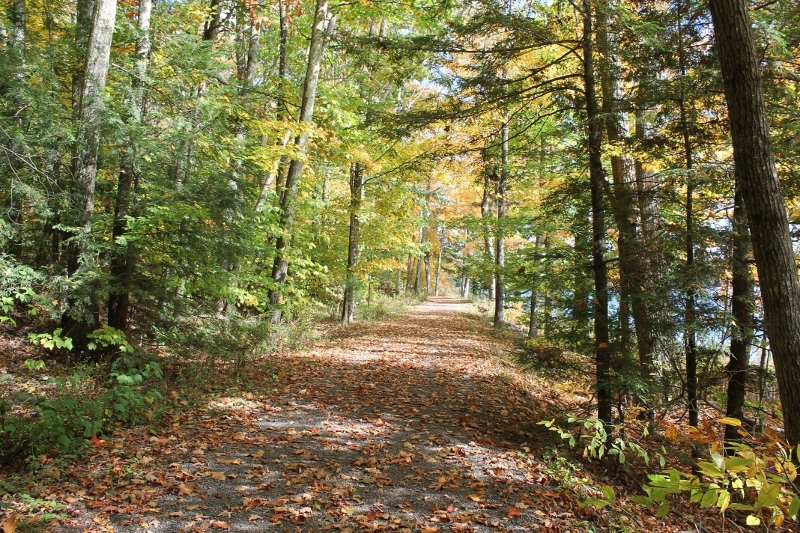 With over 200 sites, North-South Lake is the largest and most popular campground in the Catskill Forest Preserve, but its seven wooded loops make for a cozier feel than you would imagine. Our family has two favorite sites here and I always do my best to nail down a reservation for one or the other. One site is lakefront (which was where we camped during our recent visit) and it’s perfect for spring or fall camping since it gets plenty of sun; the other sits above, but within sight of, the lake under a canopy of trees which allows us to enjoy shade all day long when we’re camping in the summer. So, for us, North-South Lake is a delightful place to camp no matter when we choose to come. The fall colors seemed muted to me this year, but still provided an enjoyable show for any and all leaf-peepers. The small lake is nearly a mile long and perfect for kayaking or canoeing (no power boats allowed). Swimming is allowed in season. But, in my opinion, the highlight of this park is its system of hiking trails. Day hikes to Sunset Rock, Artists’ Rock, Inspiration Point, North Point, Mary’s Glen, Ashley Falls and Kaaterskill Falls are popular and those in the know will head out early in the day if they desire solitude on the trail. North-South Lake is spectacular on a bright, sunny day but, on days when it seems to pout, with mist rising from the lake or fog blowing in to obscure the other shore, it is just as endearing. Even though there were a few drizzly days while we were there this year, the number of camping families (including tenters!) braving the chilly and damp October weather was impressive. As I walked through the main parking lot at North Lake over the Columbus Day weekend, I noticed license plates from New York, New Jersey, Vermont, Connecticut, Massachusetts, Rhode Island, Maryland, Pennsylvania, Illinois and Québec – a commendable turnout for a fairly small park tucked away in the mountains at the top of a dead end road. Better yet, as I walked through the camping loops (scavenging for those elusive 10,000 steps) I consistently heard laughing children and happy family conversation - and that really warmed my heart. North-South Lake in one of its "misty moods"
A quiet week at one of our favorite campgrounds was a sweet – and bittersweet - way to end our camping season. As we said our goodbyes to the lake, we knew we were on a collision course with an incredibly hectic week ahead. But thoughts of our favorite outdoor pastimes are never far from our minds and Alan and I are already planning – and looking forward to! – the travel adventures awaiting us in 2019. If you would like additional information on North-South Lake, be sure to visit the DEC's web site (link HERE) then click on over to ReserveAmerica (link HERE) to make reservations. Just don't take my site! I'm ready to pack my long dormant gear for next season! I always keep my Mom's admonition in mind ("Don't wish your life away!") but, I have to admit, part of me is already longing for those first warm days of Spring. What a beautiful place to camp! I haven't been camping for quite a while, and never with a trailer. I'm not sure I'll ever tent camp again, but carrying life's comforts on four wheels is tempting. We enjoyed tent camping until Ryan was about two. After that, my body said, "No way, no how." I will admit that we're spoiled with comfort and convenience. Prepping the trailer at the start of the camping season and having only to add our clothing and fresh food for each trip makes it a breeze whenever we want to hit the road. Spoiled? Definitely. Although I must say, I did feel a wee bit guilty on those cool, drizzly nights at the lake when our heat came on and I realized that the families who were tent camping didn't have it nearly so pleasant. Janis, for another view of North Lake, just take a look at the photo at the top of the blog. It was taken a number of years ago and the perspective is exactly opposite the photo in this post that's out our back window. In fact, in the photo up top, if you look closely and straight across the swimming area to the far shore, you'll see our older travel trailer - it's the white camper furthest to the right. Same campsite, too! The hook ups at this campsite doesn't include electricity or individual running water. I also don't see any dump station locations either. No thanks. Your site is safe with me. Hi, Cindi! 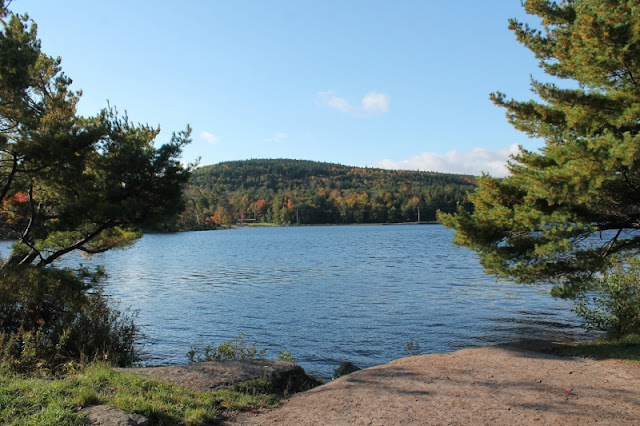 Based on our experience, it seems that the majority of state-owned campgrounds in New York don't have electrical or sewer hookups, and rely on water spigots scattered throughout the campground loops. Since we typically dry camp anyway, that doesn't matter to us but, for those who need or want full hookups, North-South Lake isn't a good fit. It does have a dump station though - it's adjacent to the Trash/Recycle Center. Enjoy your fall adventures!